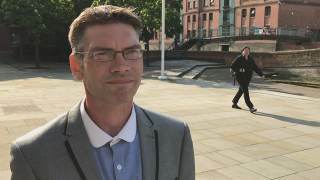 Only a week after Mike Overd and Michael Stockwell's public order convictions were overturned at Bristol Crown Court, another preacher has been acquitted of a public order offence charge. Supported by the Christian Legal Centre, Andrew Frost was acquitted last week at Nottingham Magistrates' Court. Andrea Williams commented: "We give God all the glory for these results, which are fantastic victories for freedom of speech and the freedom to share the life-giving news of the gospel." The Christian Legal Centre has a 100% success rate in defending street preachers. Thank you for your support. But Andrew was charged under the Public Order Act 1986, "with intent to cause harassment, alarm or distress used threatening, abusive or insulting words or behaviour." Supported by the Christian Legal Centre, Andrew was found not guilty at Nottingham Magistrates' Court last week. The court also ordered the repayment of his legal fees. Andrew said: "I wanted these men to know the truth, that Jesus can set them free. Because in the sight of God, these things are wrong." "I am thankful that the judge saw sense and acquitted me of this charge," he continued. "Christians need to be free to share the good news of the gospel to anyone who will listen – as we are commanded in Scripture to do. "I want to say thank you to the Christian Legal Centre for supporting me throughout this process."